It’s funny how the cars you really don’t expect to get under your skin manage to do so, but the long-term Volkswagen Passat Estate I ran for six months has managed it. And now it’s gone, I’m missing its superb all-round ability. That’s the key to the VW’s allure – it doesn’t move the needle in terms of advancing car design, packaging or engineering, but it does all manner of things to a degree that its rivals simply can’t match. Sure, some may have bigger boots, others might have more efficient engines, but right now there’s nothing comparable to the Passat Estate’s completeness. The number of them you see on the roads is testament to that. It’s a handsome example of the station wagon genre – elegant yet mildly aggressive; there’s a tautness to its lines that make some of its key rivals look a bit flabby. 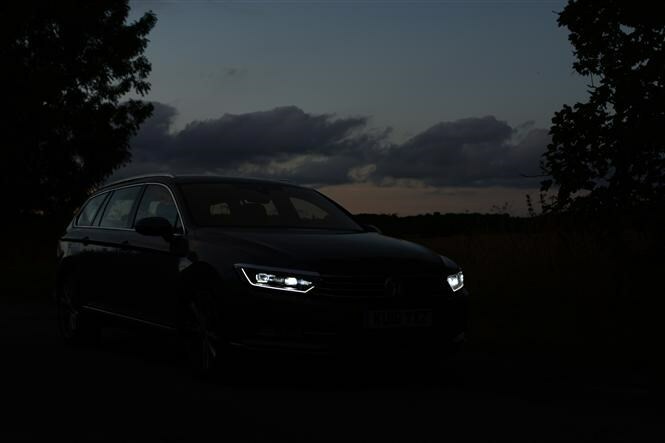 As part of the £1,340 Vision and Communications Pack, I made the most of the LED headlamps for night-time driving, although having to operate the main beam manually became a chore (what’s become of me? ), while the reversing camera neatly hidden behind the tailgate’s VW roundel never got dirty, and provided an image of clarity when edging out of my concealed driveway. I’m less convinced about the idea of spending £950 on the Lane Assist with Side Scan function; the blind-spot warning aspect was useful and reliable – other cars we’ve tested seem to go off randomly – but the self-steering function’s not really enough of a benefit for me. I’m not anti-autonomous cars, but these tentative steps in that direction add little to my driving experience. The interior’s a fine place in which to spend time – and 13,865 miles’ worth of time was spent there – occupying a sensible niche between the uber-premium Audi cabin on one side and the ever-so-slightly less special Skoda offering on the other. Although that peculiar shade of brown leather’s grown on me, I’d still be brave/foolish/old-fashioned (delete as applicable) and have ordered the pale beige hide alternative if I was buying one myself. Of the options fitted, the uprated multimedia system with eight-inch touchscreen and Apple CarPlay was great, although it’s a tad steep at £825. However, it always worked reliably, the sat-nav never got me lost and the sound quality was more than acceptable. While I quickly appreciated the benefits of the keyless entry and remote-control tailgate, I only managed to open the boot once by wiggling my foot under the rear bumper; £600 for it isn’t cheap either. Less impressive was the £290 Cargo Management System with sliding load bed – save your money there – and due to the period of the year I ran the Passat I didn’t get to experience the feelgood factor of the heated steering wheel (£205) or the electrically-heated windscreen (£345). 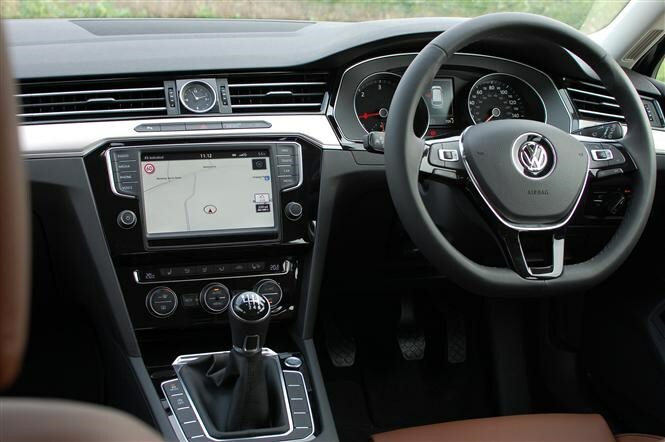 On the driving front, I suspect a DSG automatic gearbox would have suited the Passat’s character better, although the manual alternative was slick and well-damped in operation. In retrospect, the 190hp version of the 2.0-litre TDI diesel would have made lighter work of hauling about the VW’s heft than the 150hp unit it had installed. On occasion, particularly when overtaking, the motor in ours just felt like it could have done with a modicum more oomph. 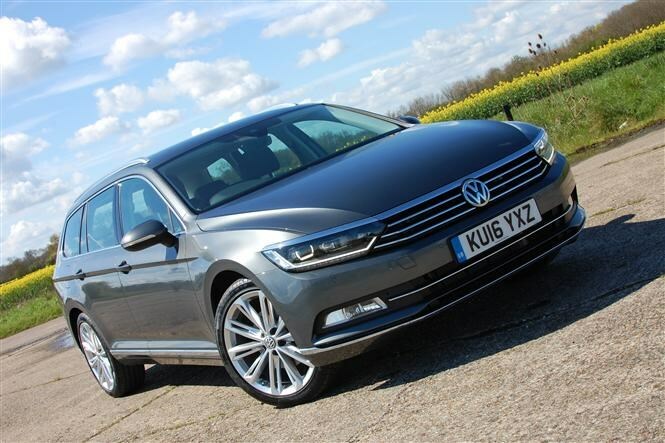 Definitely go for the XDS electronic differential if you’re considering a Passat – it’s £185 you won’t see, but the acceleration away from corners and roundabouts as the traction’s better managed than if your right foot was working unilaterally is mightily impressive. 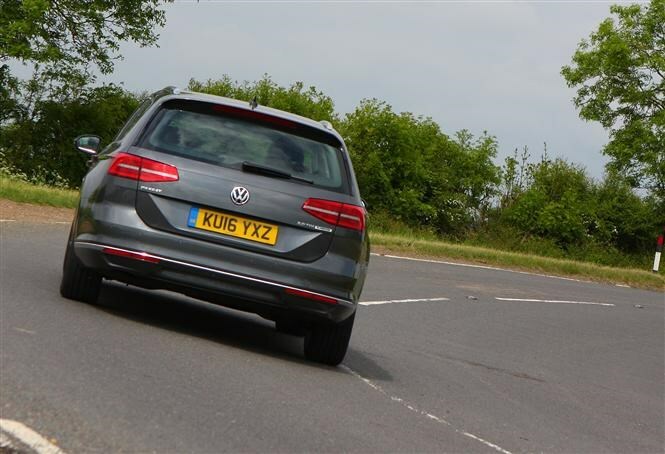 Of one point there is no question – having driven other Passats on 18-inch wheels with the optional adaptive suspension, it’s definitely the way to go over the optional 19s and standard springs fitted here. Much more comfortable and relaxed, just as the Passat should be. 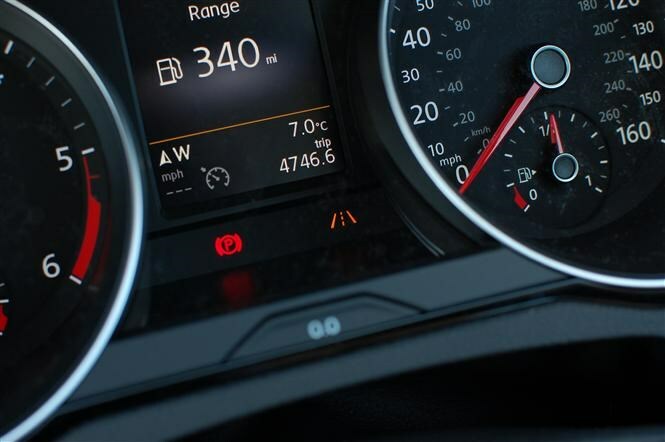 Over the course of nearly 14,000 miles, the Passat guzzled 1,341.56 litres of diesel at a cost of £1,462.73, averaging 46.9mpg in the process. That’s some way short of the official claim of 67.3mpg, but for a real-world figure on a car of the VW’s size, it’s a number we could live with. At £28,425 before optional extras are factored in, the GT trim level is a sweet spot in the range but the SE and SE Business below it are hardly poverty-spec specials. So that’s that. A high-quality, no-nonsense, capacious estate which appeals through doing most things very well rather than relying on gimmicky addenda to make up for its shortcomings. 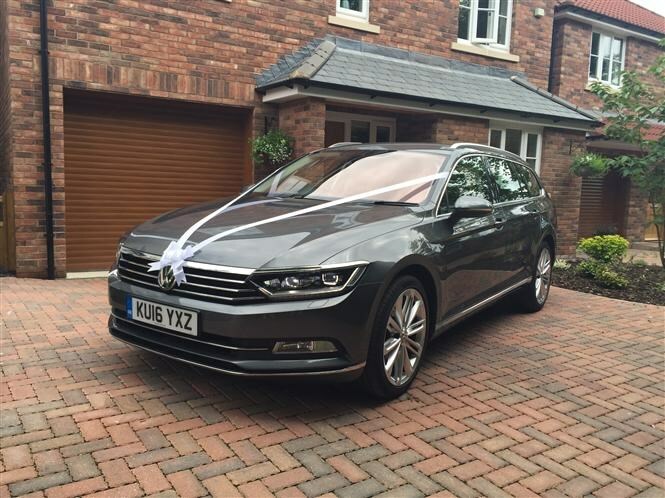 If you’re in the market for a large, family car, the Volkswagen Passat Estate simply has to be on your shopping list. Meet Zoe and Steven. They’re a young, car-enthusing couple with a lifelong passion for all things BMW and MINI, evidenced not least by a V10-engined M5 nestled in a corner of the drive, eagerly awaiting its next B-road blast. Such change has brought their car choice to the forefront of their minds and for the first time not only are the couple considering an estate, but Heaven forbid, it shall also have a diesel engine. And, [whispers], it probably won’t be a car from the BMW Group stable. 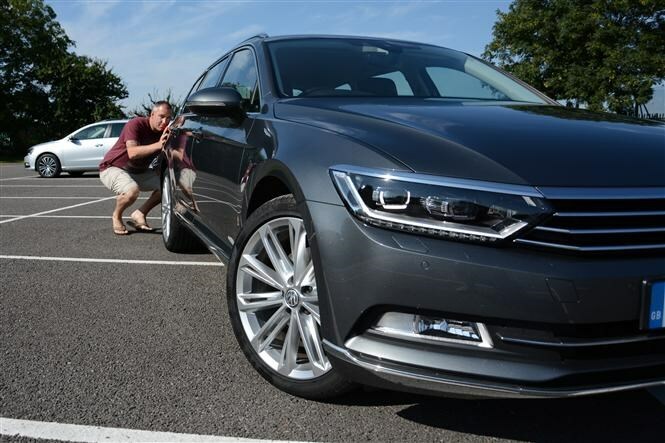 Could our long-term Volkswagen Passat Estate fit the bill? 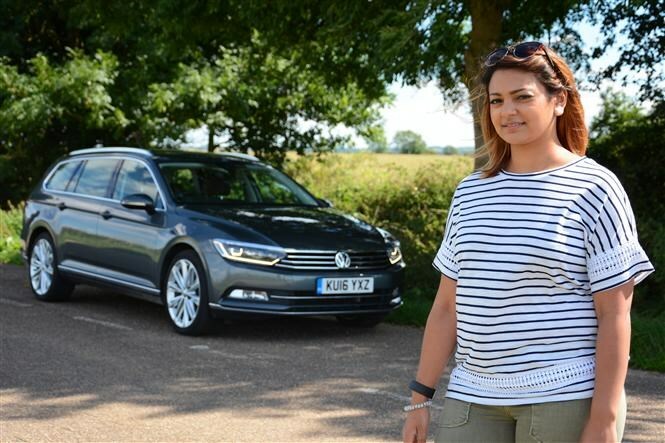 “I hate sexist nonsense spouted about cars but there’s something about the slick lines of the Passat that I suspect are more broadly attractive to women than the traditional boxy and intimidating looks of estates in the past. From a looks point of view, I can go with this. “It’s similar inside – what a lovely place to be, comfortable and spacious, fitting Cece’s ISOFIX child seat would be a doddle. 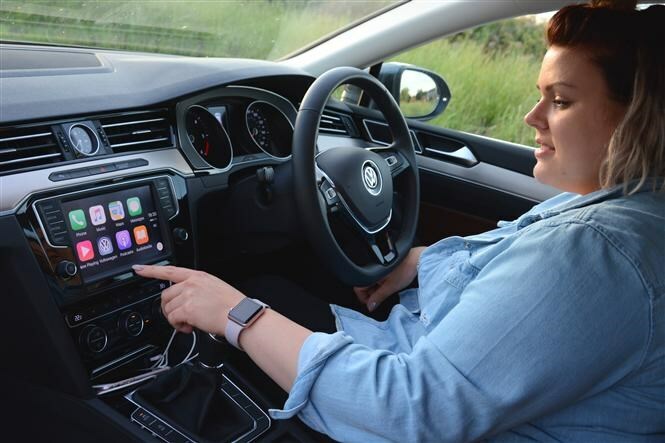 “What I’m especially blown over by is Apple CarPlay – I’ve heard and read about it but never seen it in action before. It’s so easy to use, very responsive and the graphics look reassuringly Apple-like. “Naturally, we’re considering an estate because with a buggy and the huge amount of clobber you have to carry around with a baby, my MINI’s just not up to the job. 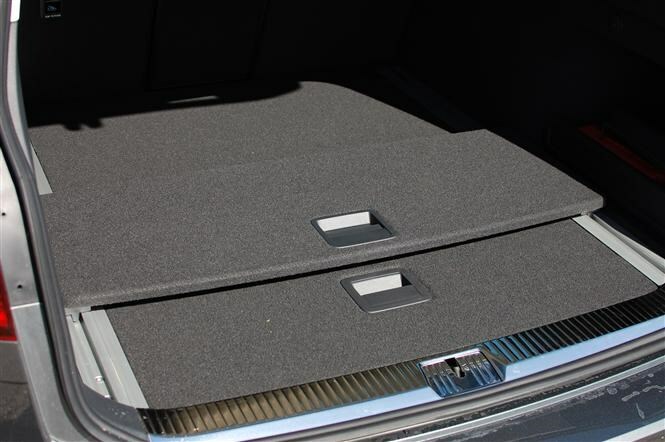 While the Passat’s very spacious in the back I don’t understand that sliding boot tray-thing. It just seems unnecessary and to my mind would hinder larger things being slid in. I could see that being taken out on day one, placed in the garage and being forgotten about. 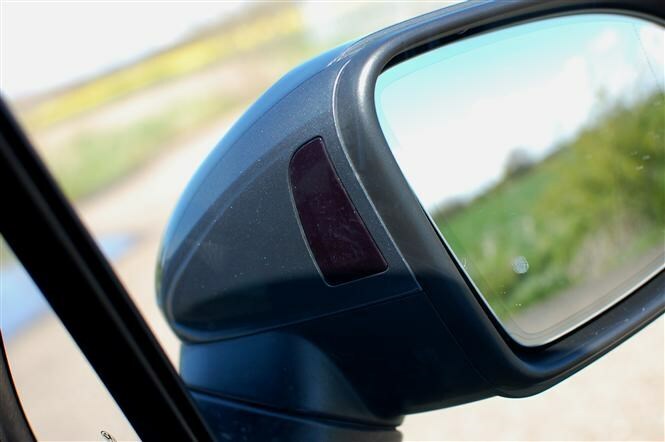 “Out and about on the road the radar cruise control is one of the best I’ve experienced. I’m loathe to use it on other cars because the minimum gap always seems too big and inconsiderate drivers wade into your braking zone. But this seems fine. “I was less keen on the crashiness of the ride quality, but those 19-inch wheels and standard suspension are jointly at fault there. On a practical, family car I don’t want my passengers or stuff in the boot being shaken to bits. “You know, my overriding opinion of the Passat is that it’s a very nice thing indeed, brimming with understated quality. A thinking man’s Audi, perhaps. 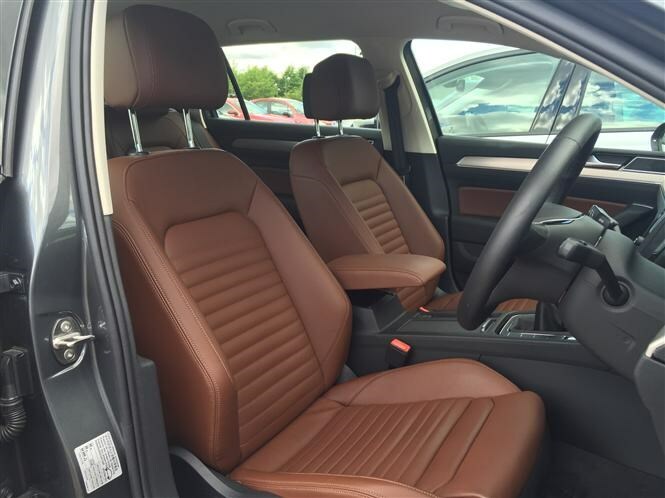 “Those front seats are very nice too, comfortable and whilst I’m not normally a fan of brown leather, they really did look great. Cabin space was also impressive, even with the driver’s seat set for my 6-feet 6-inch frame someone could have sat behind me. “I like the folding action of the rear seats [levers in the boot] – it’s a great idea, I don’t know why everyone doesn’t do that, but I struggle to see the point of that sliding load tray, I think it would be more of a hindrance than help. “Back outside the exterior styling I felt was subtle and very distinctively VW. The larger wheels looked good and suited the car, again though, I imagine a bit tricky to keep clean. “I loved the LED headlights and they’d be something I would definitely have to pay extra for. To me, VW always seem to be able to produce family cars which have a quality and premium look without looking too “shouty”. “From the outside the engine sounded a bit gruff and diesel-y, which is to be expected I guess, but it reminded me how much I prefer petrol engines. Volkswagen’s evolutionary styling of its core models – Polo and Golf, as well as the Passat – reflects how loyal a large chunk of its customer base is. You might occasionally read car journalists bemoaning VW’s same-again approach to car design, but in terms of not alienating repeat buyers the old adage of “if it ain’t broke don’t fix it” rings true. Create something too far removed from what’s known and liked and rival brands’ showrooms could suddenly become busier. 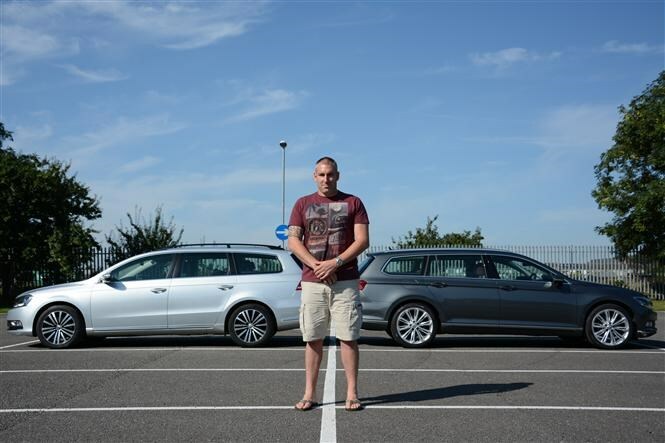 I decided to put this to the test with two friends who each own the previous-generation Passat Estate. They’ve already spent a few years living with their cars and know them inside out. What would they make of the latest iteration and does it remain true to their Passat perceptions to consider one come trade-in time? 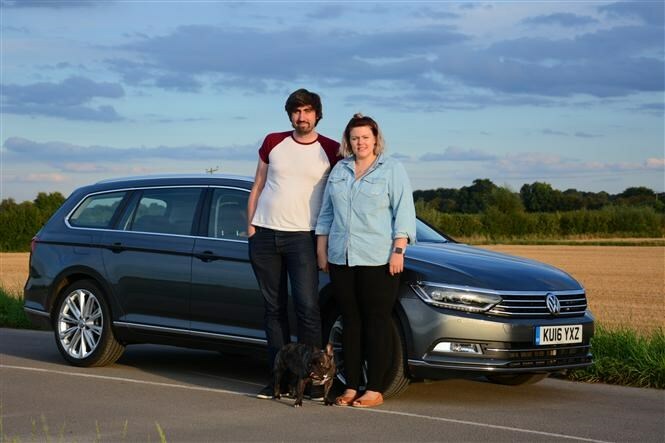 “There’s something a bit granddad-like about my Passat but this one’s much sportier, with the sharper edges and the LED headlights. It looks really sleek and, if I’m honest, its looks alone would make me consider one next time. “Although I’m a confident driver I don’t like driving at night much, but those optional, brighter headlamps might make me feel more comfortable doing it – £1,000 is a lot, though. “There are far too many electronic sensors and systems on it for my liking – I wouldn’t even have parking sensors if they were optional! I know they’re there for safety but I think if you’re that poor at driving that you need these things then you probably shouldn’t be on the road anyway. 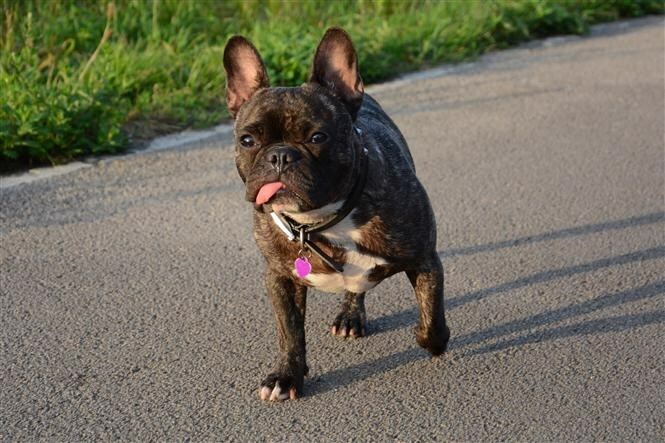 “When I’m driving I just find them too sensitive and the beeping puts me off. The system that helps steer the car is far too much – I like to feel like I’m in control of the car, not the other way around. “Everything else I really liked: it feels smoother on the road than mine, even with larger wheels, and the double glazing helps keep the interior quiet – I’d probably consider adding that as an option. The electric tailgate’s really handy, although it doesn’t seem keen to work when you wiggle your foot under the bumper. “I can’t get over how much room there is inside – you can easily get three adults on the rear seat, so three kids will be easy, plus if someone petite like me’s driving it’d be like a limo back there. “I’d have to have Apple CarPlay too, although it’s not going to help me detox from my phone addiction! “It looks really sleek and refined, doesn’t it? I like how the creases along the side are deeper and more pronounced than on mine. “Inside it looks and feels more upmarket, too – more like what you’d imagine an Audi to feel like. I wasn’t keen on that full-width strip across the dashboard at first, with that fake vent in the middle, but the longer I spent in the car I liked it. It mirrors the front grille, which is a nice touch. “I really like in-car tech, so that enlarged sat-nav screen is definitely something I’d go for, but I’d also have the fully electronic instrument pack, too. I saw it on a TT and really liked it. “There’s no doubt the LED headlights are an expensive option, and it almost seems like a joke that you have to pay extra for automatic main beam, but they’re something I’d consider as I tend to do quite a bit of driving at night, especially family trips down to the south coast during school holidays. 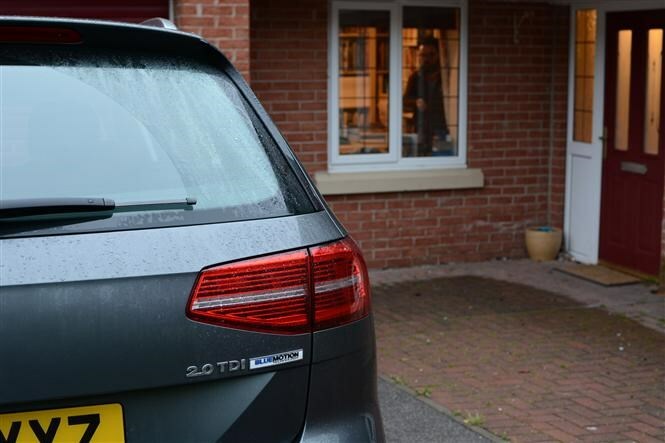 “Keyless entry would be great when you’re trying to wrestle two tired and stroppy children into the car, and while I like the electric tailgate it didn’t seem that keen to operate when I waved my foot under the bumper. I really don’t get that sliding boot floor, though. If it flipped up at 90 degrees and acted as a separator I’d go for it, but as it is, no. There’s loads of space in there, though. “Those driving aids would take a bit of getting used to, especially all the beeps and bongs, but I can see how they improve safety. 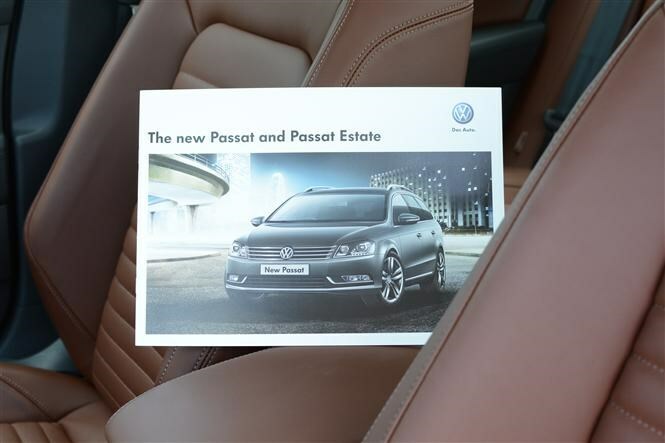 “One small change that I really like is how easy to access the ISOFIX points are in the rear seat on the new Passat. On mine there’s a danger you’d nick the car’s upholstery as you clip the seat in but it’s virtually impossible here. Resounding praise from those two, but you’d arguably expect that from existing owners. In the next update we’ll be seeing what a couple considering buying their first family estate think of the Volkswagen. Will they be as easily convinced? 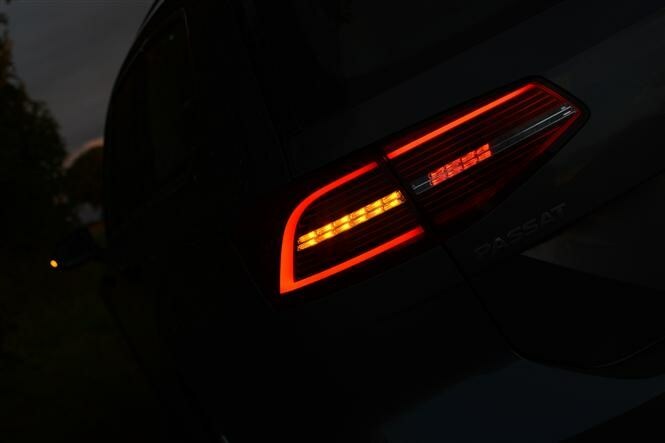 Whenever I show anyone around our long-term Volkswagen Passat Estate, those distinctive head- and tail lights always come up in conversation, usually with the observer concluding that they don’t see the point in spending extra on them. Safety has always been a tough sell for most car manufacturers, until Euro NCAP highlighted just how origami-like some family favourites were in a series of controlled crash tests. Perhaps now that most cars achieve four or five stars, buyers have decided that essentially they’re protected enough without spending extra on additional safety kit such as LED lighting. Having driven several cars, including the VW, with LED lamps fitted, I’m fully converted to the technology’s benefits. It’s worth pointing out that what Volkswagen calls the “dynamic lighting effect” rear LED lamps are standard on this GT grade model. 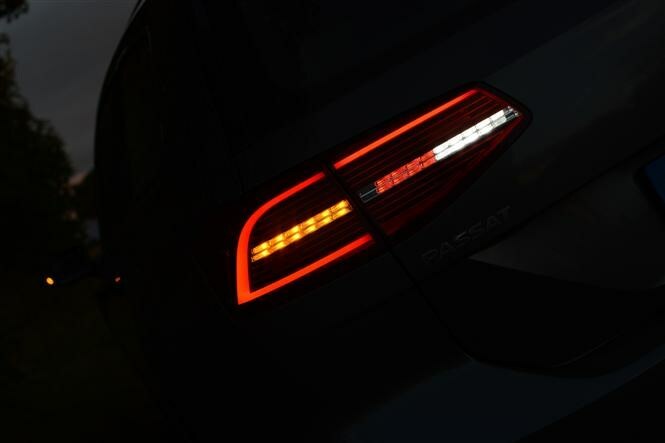 They feature a different illuminated graphic to lesser models, with three oblique slashes for the braking elements, arcing tail lights, horizontal indicators and exceptionally bright reversing lights, which combined with the clarity of the rear camera, make rearward manoeuvres easy to undertake in the dark. 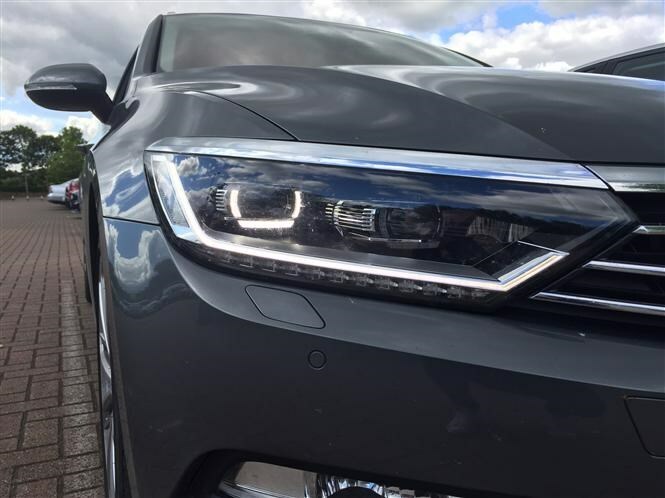 Where the extra cost comes in is with the LED Premium headlamps, costing a not inconsiderable £1,220 more than the standard set-up. While the sun’s up they’re distinguished by a “double U-shaped” day-running light signature, with a dozen LEDs for the indicators in the lights’ lower edges, but it’s at night when they come into their own. Not only is the whiteness of their illumination impressive, the horizontal spread and the distance they shine are great. Like many systems, they have a dynamic quality, turning the beam of light as you corner, reducing the likelihood of you encountering unsighted hazards as you navigate bends on otherwise unlit roads. During many months of the year I commute both legs of my journey in complete darkness, hence why I’m such a fan of LED lights. So far, the only weakness I’ve encountered with them was on a previous long-termer – they don’t generate sufficient heat to melt snow that falls upon them, but the Passat’s headlamp washers should overcome that, providing they don’t freeze. As much as I’m impressed with the Passat’s optional LEDs, it’s disappointing that an automatic main beam function costs a further £115. If you do opt for that system also be aware it’s a fairly simple arrangement that merely dips the whole light, rather than having a matrix function for sectioning off parts of the light pattern to prevent incoming drivers from being dazzled while still keeping the rest of the road brightly lit. 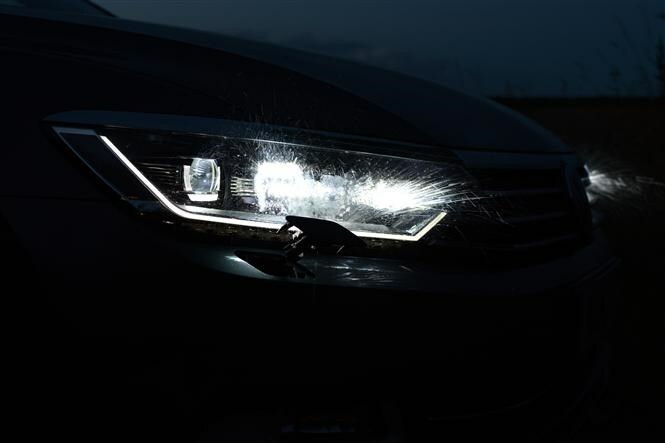 That aside, if you regularly drive in the dark, LED headlamps remain one of the must-have features to consider when buying a car – once you’ve tried them, you’re likely to find anything else inferior. At times I feel like I’ve failed as a father. When I talk to other motoring journalists I’m envious that their kids appear to have inherited their parents’ passion for all things automotive. Maybe it’s because my three have grown up surrounded by piles of car brochures and magazines, some of which are older than their grandparents, that they’ve become wholly immune to my indoctrination regime. I thought all was lost until one evening I rolled up and my daughter nonchalantly remarked “I see you’re in the Foaks-var-gen.” I was aghast – there’re many dyed-in-the-wool-VeeDubbers who don’t pronounce the brand name with such Germanic authority. Sensing I was about to witness a pivotal moment in her life, I asked if she knew which model it was. “Hmmm..,” she pondered, “is it a Pazzan?” Pffft. Nevertheless, I used the moment as an opportunity to cajole some thoughts about the VW from Lily and her older brothers Jack and Fin. They loved every moment of it*. Lily, 10: “I like the fact there’s a button to open and close the boot on the key as it’s handy, if like me, you’re not very tall and can’t reach up to pull the boot door shut. 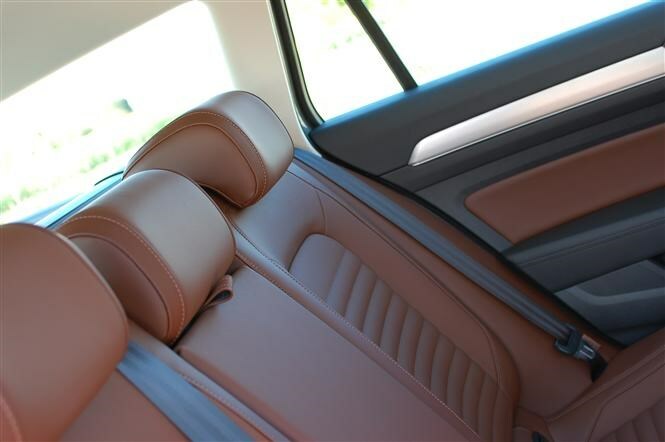 The seats in the back are nice and padded and even the middle one is comfortable – it’s rock hard in some of the cars you have. Fin, 13: “I miss that it doesn’t have an opening roof – not a convertible one, I don’t mean, just a glass one that slides. It’s a really comfy car – you could go on a long journey and not ache when you get out at the end. 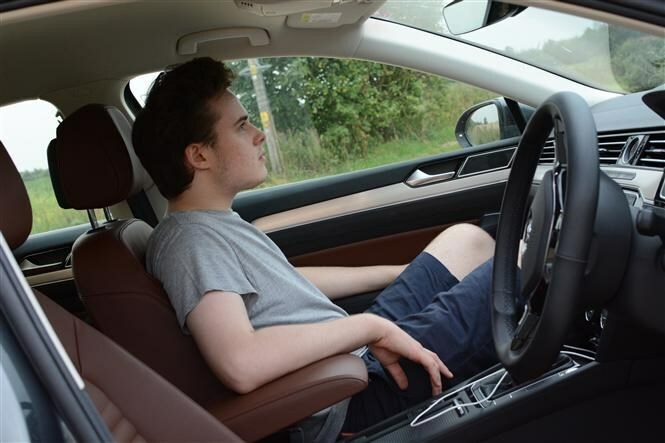 Jack, 15: “I’m not keen on it not having a glass roof as, although it’s not dark in the car, it could feel more open and airy. I’m not sure picnicking in the car would be that easy either, especially if you’re in the front. There aren’t many flat surfaces for putting your food. 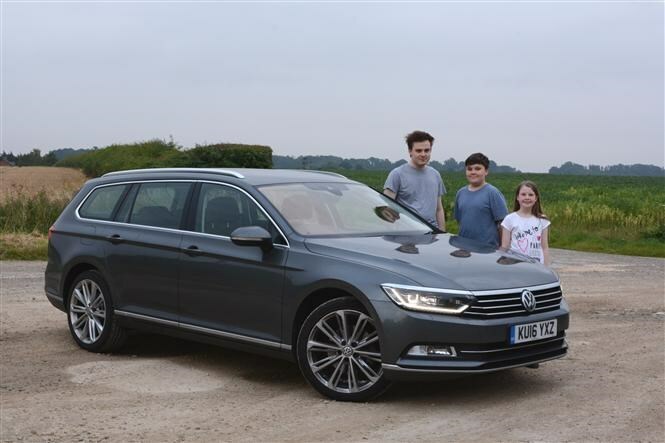 So there you have it, from three not-remotely-car-enthusing under-16s: the Passat Estate’s comfy, spacious, not embarrassing and is laden with bum warmers. Do you need anything else? 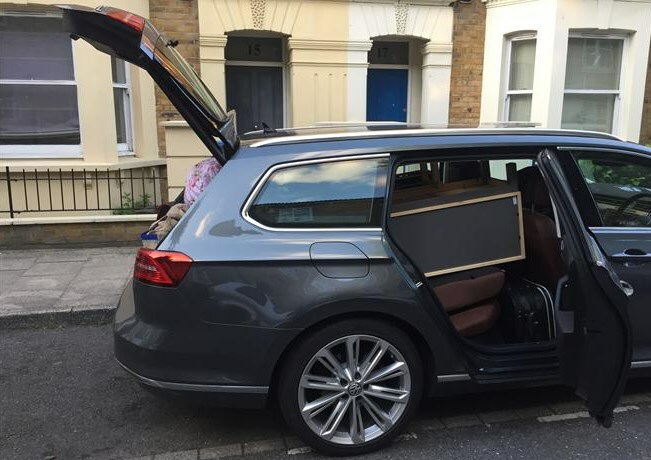 Fresh from its stint as a wedding car in the West Country, our Volkswagen Passat long-termer has been ushered back into its natural habitat – moving many heavy and awkwardly shaped items. The removal mission in question was for my significant other, who is moving back to Wales having finished university for the summer. Cue a mad dash from Peterborough to Central London where a mound of clothes, shoes and shelving units awaited the Passat. 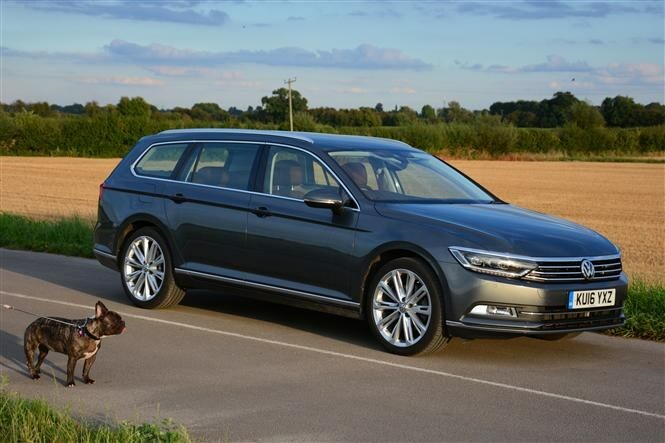 No matter though, the big Volkswagen’s boot can take a gargantuan 1,780 litres of luggage with the rear seats folded down, a full 195 litres more than the Ford Mondeo Estate. Things are made even simpler by the easy-folding rear bench and electronic tailgate Tom mentioned in the previous update. Pull two conveniently placed levers and the seats fold down – not quite flat, but near enough to accommodate long objects without any fuss. Something that struck me as I closed the boot on a job-well-done of packing, was just how boxy the latest Passat is. This obviously has packaging advantages and makes the car a great load-lugger, but what does it to its looks? Some may disagree here, but I think this is one of the most attractive estate cars on the market; strong, defined lines and a willingness to embrace its estate car shape make it a real looker in GT spec. Is it a thing of beauty? Drop us a line on Facebook or Twitter and let us know your thoughts. 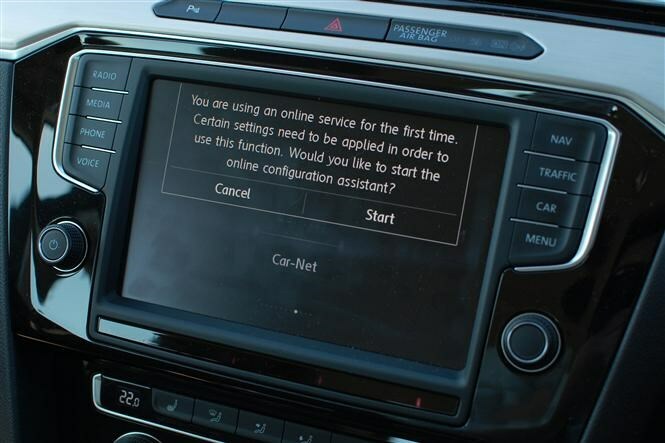 London to Cardiff took us around three hours, giving me a proper chance to test the Passat’s multimedia system. 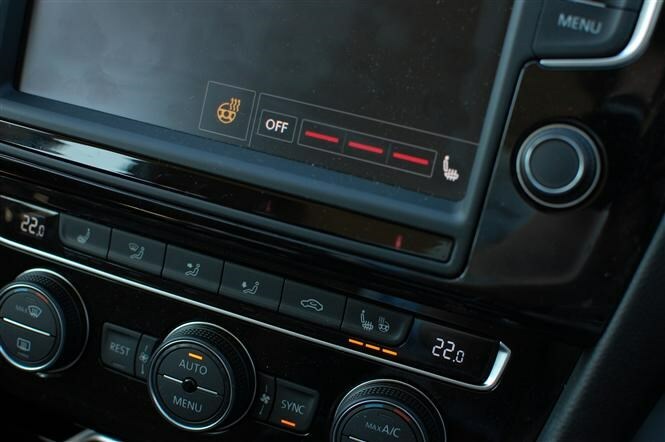 As part of the optional Discover Navigation Pro package, the car comes fitted with Apple’s CarPlay functionality, allowing the user to control aspects of their phone via the central infotainment screen. I’d used it the week before in a Vauxhall Astra and found the technology surprisingly easy to use - if not completely polished. 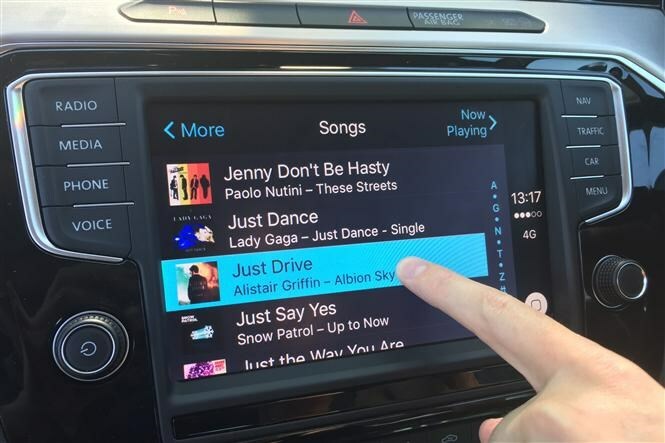 One glaring issue we found with the Passat’s system occurred when the user scrolls through a list of songs or playlists. Although track names are displayed clearly, the screen does not respond well to scrolling motions, often selecting the track your finger ends up on. It’s not a disaster, but does cause a great deal of frustration when trying to find a particular song, meaning the driver’s eyes are taken off the road. 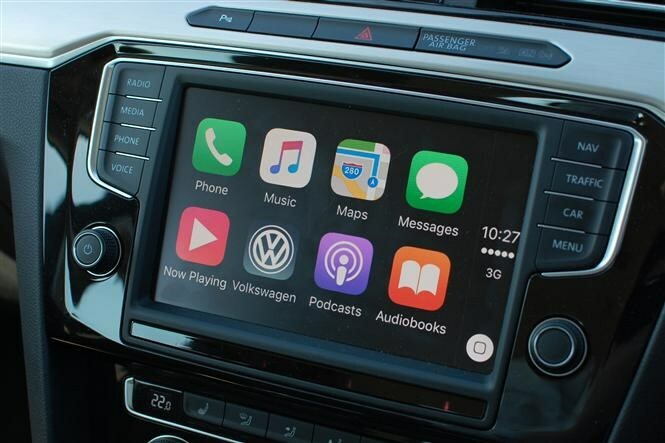 Scrolling through Volkswagen’s own multimedia system is fuss-free, and since such a problem didn't occur in the Astra, it could be an Apple CarPlay/Volkswagen compatibility issue. 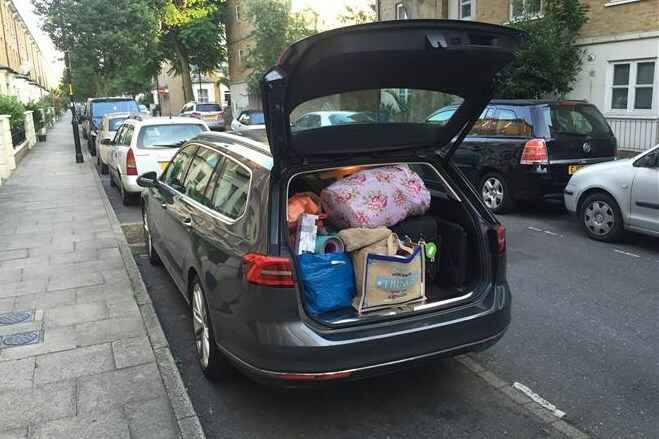 Our Volkswagen Passat Estate is proving to be a car of many talents. Just a couple of weeks after being used as a removal van, it was given a good scrubbing for its role as a wedding car for my sister’s nuptials in the middle of the Devon countryside. That meant a 200-mile trip from Buckinghamshire to the West Country was in order, and the Passat coped very well indeed. It’s clear this car has been designed for use on the motorway and the torquey 150hp diesel felt up to the job, although a bit more power would have been welcome in one or two situations. 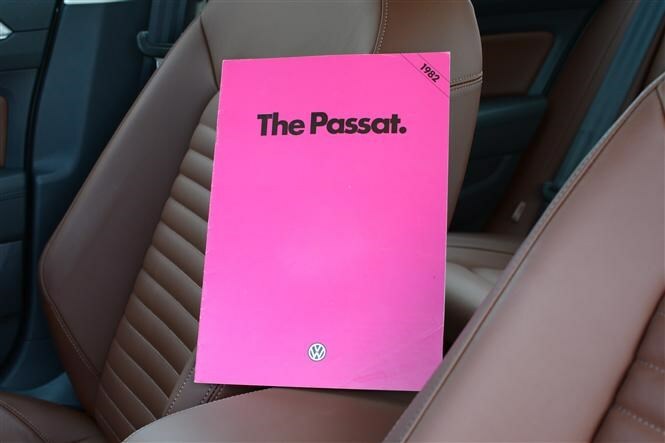 Where the Passat really excels is in the comfort stakes. The ‘ErgoComfort’ seats in our car have adjustment in every direction imaginable, meaning you can spend ages fiddling with the controls to find the perfect driving position, but you’re rewarded with an exceedingly comfortable set-up once you’ve finished. 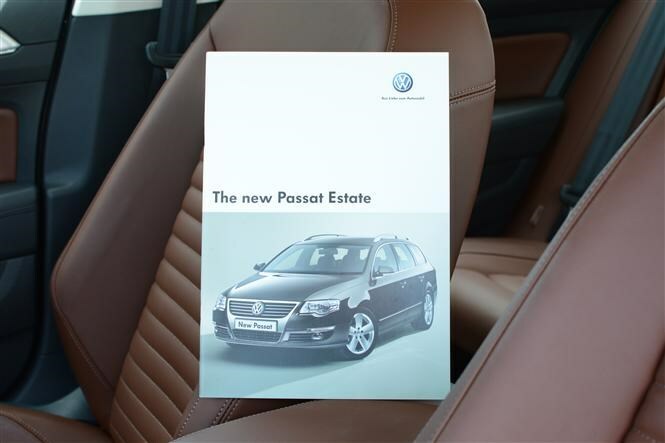 This is all compounded by the fact the Passat is just a pleasant place to spend time in. The interior design won’t excite you, but the materials used are plush and everything is a doddle to use. The beauty in the Passat’s design is that you can jump in and use it without having to spend ages trying to decipher how everything works. So the big day arrived and the ribbon was tied to the front of the car. A Passat Estate probably isn’t at the top of most people’s lists as a wedding car, but it was remarkably well-suited to the task. 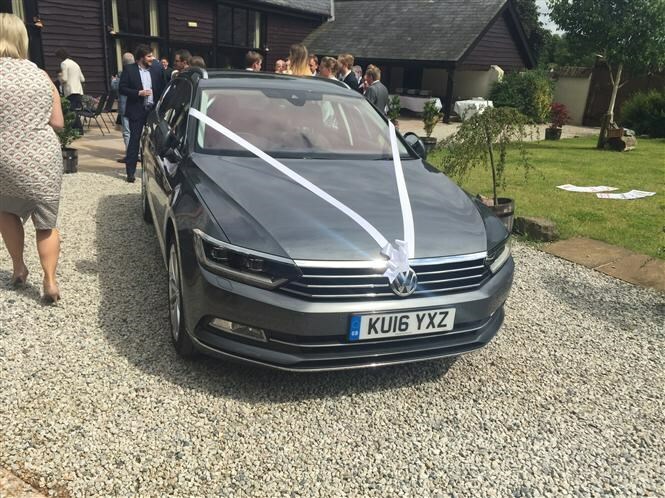 Our car’s Marrakesh brown leather trim received plenty of compliments from the bride and father-of-the-bride, while the spacious cabin proved to be a hushed and relaxed environment for them ahead of the big event - thank the double-glazing for that. Devon's tight, winding and pothole-infested country lanes were the Passat’s biggest obstacle to overcome on this trip, though. Extra care was required to avoid both damaging the big 19-inch alloys and upsetting the smooth ride - even smaller bumps cemented our thoughts that it could do with slightly smaller wheels on rougher surfaces. The car’s reversing camera really helped when faced with tractors and even the odd cow (yes, really!) 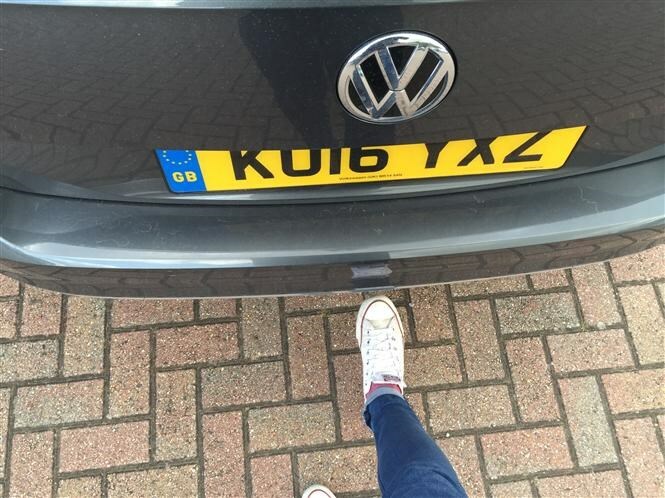 – it’s hidden away behind the VW badge on the bootlid and pops out when needed, so it never gets dirty. Touches like this show real thought has gone into the integration of the useful features on this car. 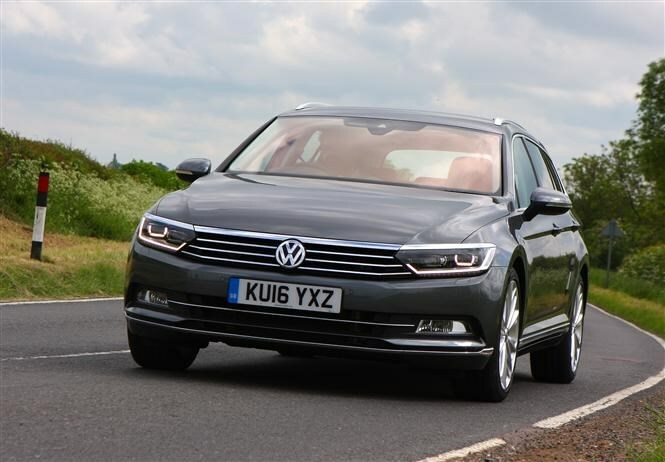 Still, on arrival the Passat drew plenty of admiring glances – the combination of Indium Grey paint and lashings of chrome trim meant the Passat looked suitably classy and up to the job as a chauffeur car – even the sun came out at just the right time! 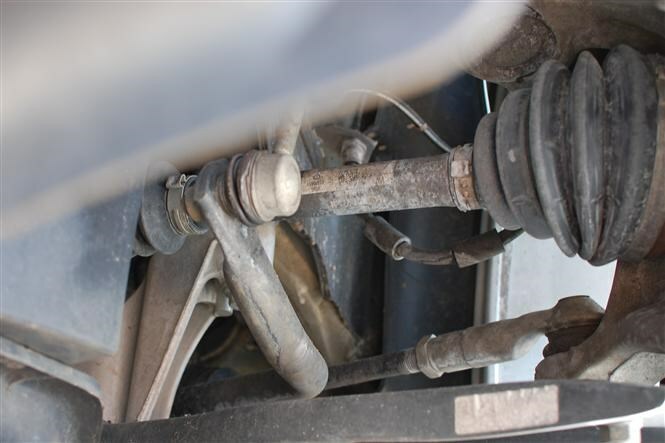 Optional extras – unnecessary or worth the money? 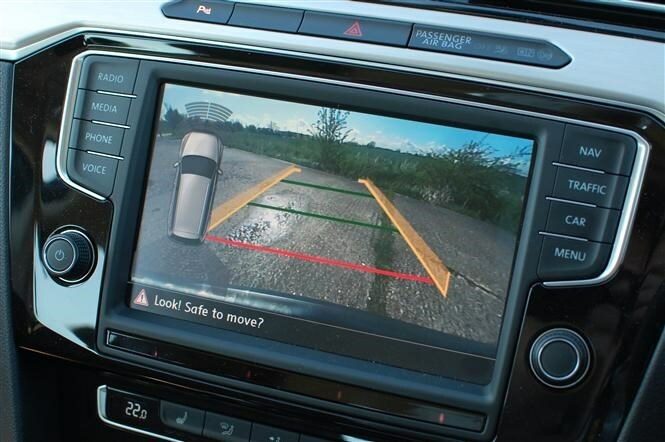 On this journey in particular, the reversing camera proved to be a Godsend. 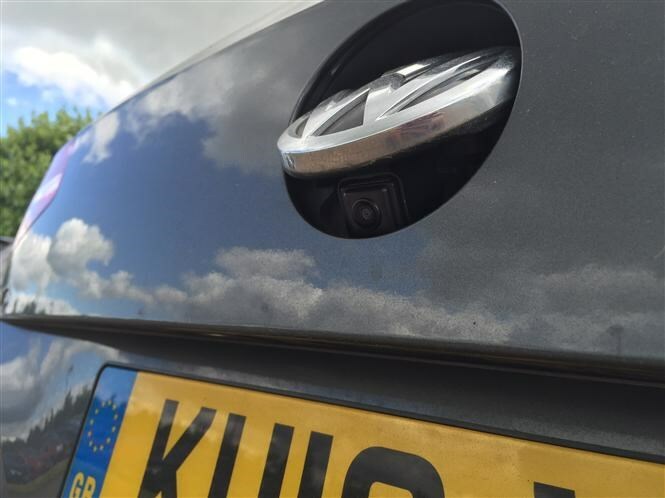 In combination with the front and rear parking sensors, it really helped thread the big VW into tight spots – and there are plenty of them in Devon. While I knew the Passat had an electric tailgate when I loaded up the vast 650-litre boot, I didn’t realise that our car has the ability to open it by waving your foot under the rear bumper – or even arms if you’re washing the car thoroughly… a black eye at a wedding is a less than desirable look. Luckily the Passat provides plenty of warning beeps to get out of the way in time. 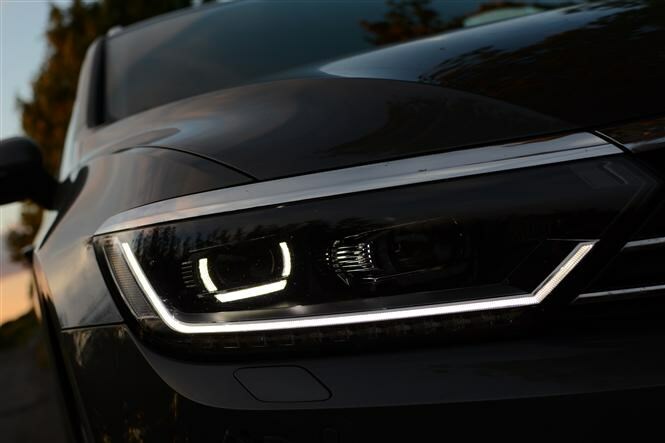 We’ve mentioned it before, but the LED headlights on our car not only look fantastic, but they’re also seriously effective for navigating dark lanes and boosting visibility for the driver, while the LED daytime-running lights add an extra air of sophistication, too. The Passat continues to be a car that just gets on with life with very little fuss, then - and one that we’re finding is up to the job of pretty much every task we throw at it. Nobody enjoys those umpteen-mile-long tailbacks that regularly blight collective morning commutes, but there are moments of surprise and delight to be found within the confines of your car during them. And so it was recently when playing “and what does this do?” with all the sub-menus I’ve encountered lurking within the ‘Discover Navigation Pro’ multimedia upgrade fitted to our long-term Passat Estate. Specifically, one previously unseen screen encouraged me to Think Blue. No, not in the 1970s comedian sense. You see these days, blue is the new green. 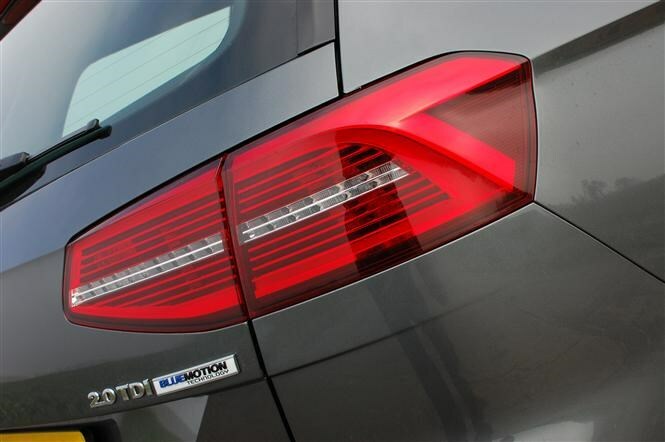 We went green a couple of decades hence, so a new colour was demanded for all those fuel-saving, pollutant-mitigating black boxes of wizardry cars are fitted with, as evidenced by the VW’s BlueMotion Technology badge on its rump. 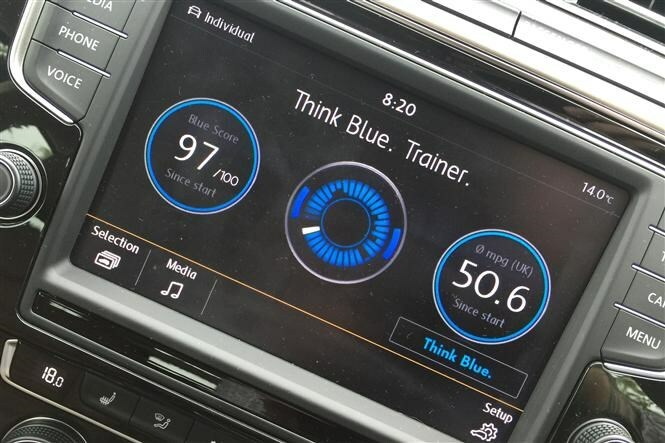 This Think Blue Trainer is designed to appeal to the competitive spirit that comes out in many drivers (not me, I hasten to add). Rather than see if you can eke past another car at 72mph to make up that all important 20 metres of dual carriageway territory, the goal here’s to make your driving more efficient, using less diesel in the process. How does Thinking Blue work? 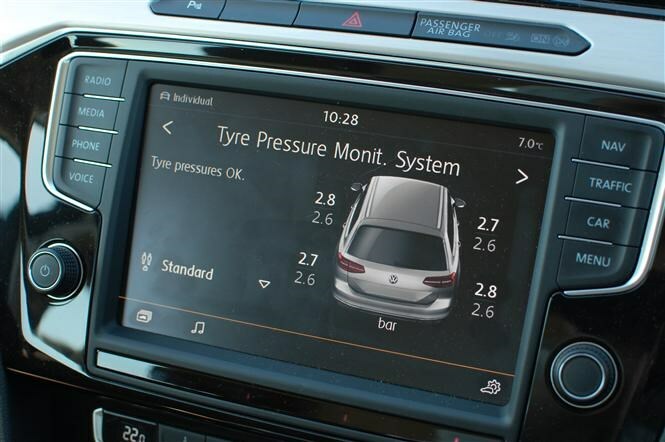 Ease on and off the throttle, pre-empt when the Passat’s going to encourage you to change gear, be gentle with the brakes and turn off the air-con (I didn’t go that far – I’m no summer sadist) for constantly updated reports on your progress. 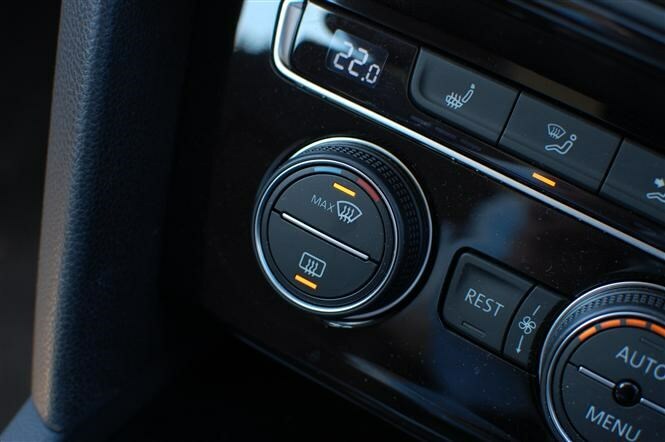 You’ll be rewarded with a score out of 100 – see, my 97 percent was achieved with the climate control on 18 degrees – as well as a wheel, with spindles that vary in length depending upon how efficiently you performed for each time segment. The result? After just half an hour and 26 miles of Thinking Blue, my average consumption jumped from a respectable 48.4mpg (not bad for someone who’s recently been lumbered with a reputation for being leaden of foot) to an indicated 50.6mpg. Decent enough for a large estate car with a 150hp engine. But now I’m curious to know how other VeeDubbers are doing – is there an online league for this kind of thing? Am I woefully off the pace? Let us know on Facebook and Twitter with photographic evidence. I love estates. Beauty’s in the eye of the beholder and all that but in almost every instance I prefer the long roof look of a wagon over the saloon or hatchback upon which it’s based. 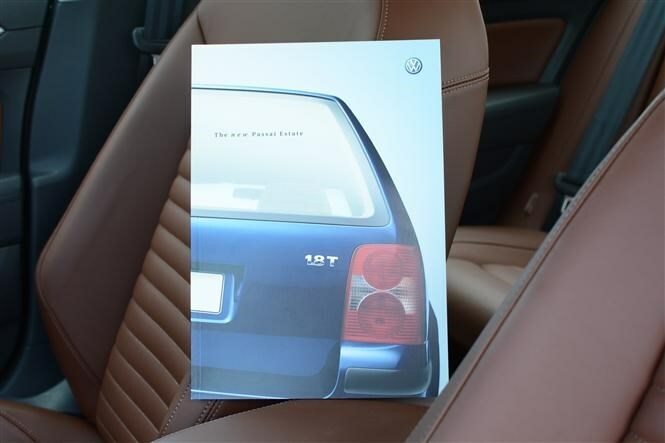 Plus, their capaciousness ensures that when I ‘accidentally’ buy a voluminous collection of old car magazines or sales brochures – yes, I am that sad – from an eBayer, there’s no danger of having to leave literature behind due to a lack of boot space. 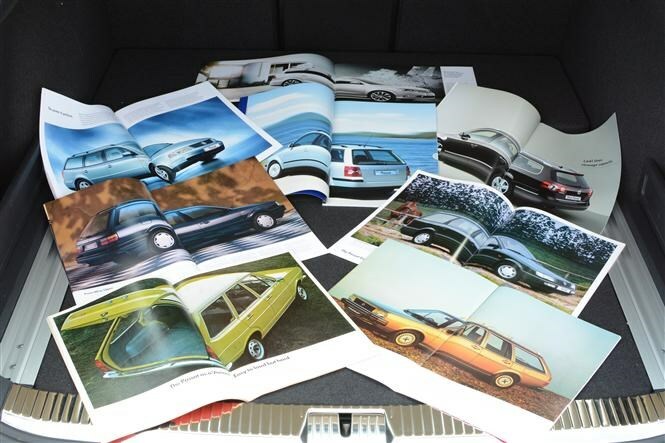 It was while I was unloading from one of these catalogue-rich jaunts, that I discovered a rich seam of old VW brochures, which consequently ensured I lost the next few hours looking at our Passat Estate’s predecessors. So – and imagine Eamonn Andrews or Michael Aspel is reading this out loud from here on in depending on how old you are – tonight Volkswagen Passat Estate, this is your life (naaah-naah-nah-naaaah, etc.). 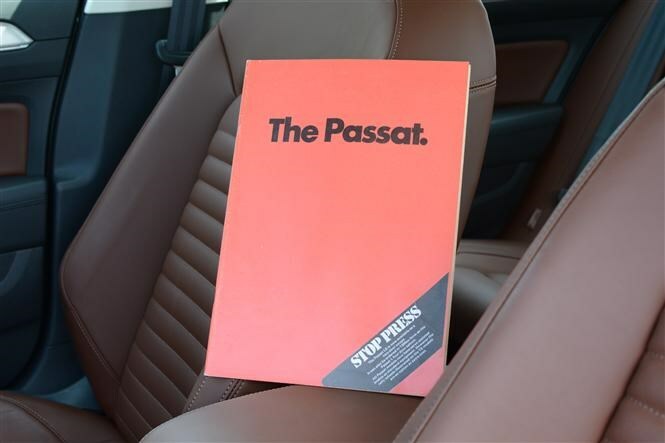 Britain got its first taste of the Passat Estate in April 1974, some eight months after the range debuted as a two-door coupe. Known by VW aficionados as the B1 Passat, it initially came only with a choice of 1.3- and 1.5-litre petrol engines with a 1.5-litre non-turbo diesel not arriving until 1979. Of those early versions, the LS 1.5 petrol is the nearest equivalent to our long-termer, despite producing exactly half of its power at 75hp. Top speed was 99mph and 0-50mph (yes, fifty) was nine seconds flat. Claimed fuel consumption was 32mpg and nobody had even heard of CO2 emissions then. Equipment highlights of that 1974 LS model included reclining front seats, carpets, a cigar lighter and a lock for the fuel filler cap. VW claimed the original Passat Estate could swallow 750 litres of cargo in five-seater mode but that was to roof height. Seats down, the 1974 edition would take 1,520 litres. The second-generation Passat Estate looked like an evolution of the first, the estate being part of the B2 range from day one. A diesel was available from launch, too – albeit a 1.6-litre non-turbo producing a dreary 54hp. Top speed? 87mph. Forget about getting anywhere quickly as 0-60mph took 21.2 seconds. At least fuel efficiency was decent at a claimed 51.4mpg at 56mph. Adding to the misery it was only available in lowly CL specification, meaning cloth upholstery, a passenger-side door mirror and a ‘large quartz clock’ were listed on the kit roster. 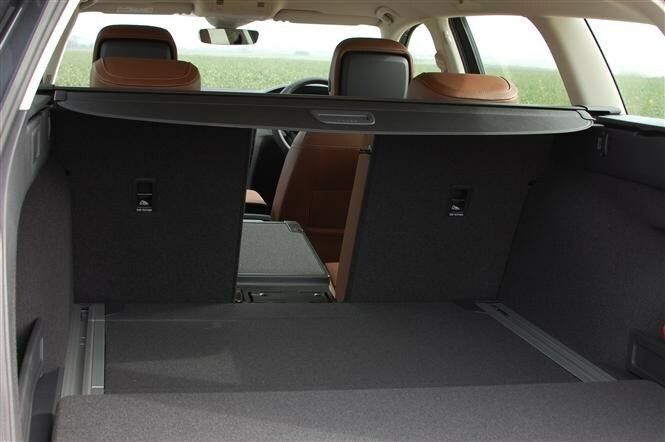 Luggage capacity shot up to 949 litres – again to roof height – extending to 1,829 litres with the seats folded over. That’s more than today’s car offers. A grille-less look was ushered in with 1988’s B3 Passat but contemporary diesel sales ensured that while the 1.6-litre unit was turbocharged up to 80hp, it still only came in entry-level CL guise. Still, it could now reach 103mph and the 0-60mph sprint had been slashed to 14.7 seconds, while returning a claimed 72.4mpg at 56mph. Equipment-wise you were treated to hub caps – not even full wheel trims – for the 14-inch steel wheels, a digital Blaupunkt radio-cassette with auto-reverse and power steering. Luggage capacity dropped, though: now 521 litres (to the window line) and 1,700 litres with the rear seat folded over. 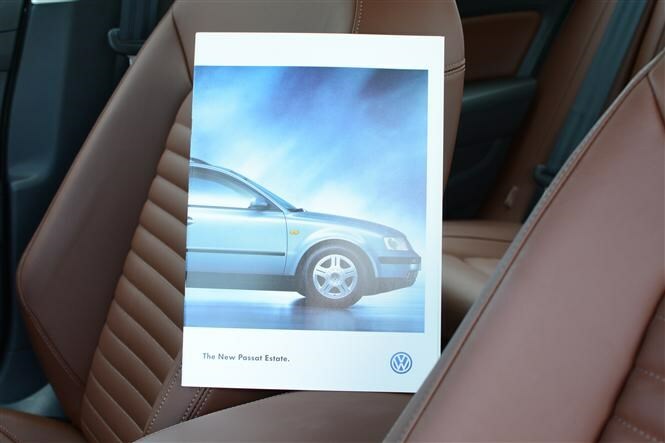 Essentially a significant facelift of its predecessor, the B4 Passat range had a relatively short life, but it was available with larger, TDI diesel engines combined with plusher GL trim. A 1.9-litre, 90hp motor nestled under the bonnet, meaning 107mph and a 0-62mph time of 14.4 seconds were possible, all while sipping diesel at a rate of 67.3mpg at 56mph. GL brought with it front airbags, central locking with a torch key, electric mirrors and a removable luggage cover. Volkswagen started measuring boot capacity using the VDA method at this time, using a series of 200x100x50mm blocks, resulting in revised totals of 465 litres seats-up and 1,500 litres with them folded. There was a brief lull before the upmarket B5 Passat Estate arrived in Britain, but the wait was worthwhile. Larger, more powerful diesels followed but at launch the 1.9-litre 110hp TDI was the one to have: 118mph and 0-62mph in a respectable 11.9 seconds. 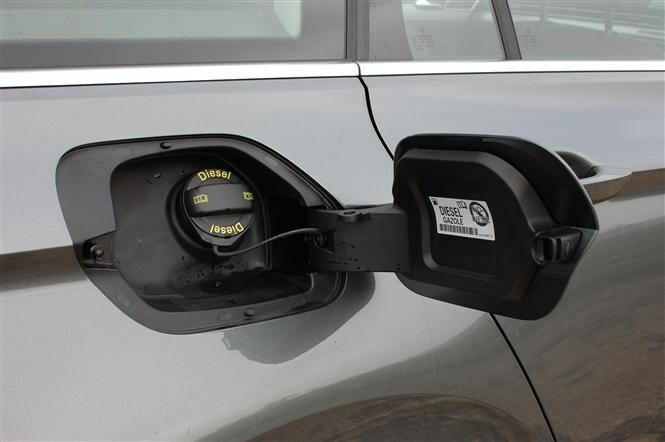 Tested under the current consumption protocol it averaged a claimed 51.4mpg. Even better was that it was available in more luxurious trims, including Sport, a direct equivalent of today’s GT. Air-con remained optional but a trip computer, a CD multichanger, 15-inch alloy wheels and four cupholders were part of the package. Space-wise the Passat Estate offered 495 litres seats-up, 1,600 litres folded. Little more than a mild facelift, the B5.5 Passat nevertheless introduced more luxury and gruntier engines. Now packing a 2.5-litre V6 diesel it only produced the 150hp of our car, reaching 62mph from a standstill in 9.8 seconds on its way to 133mph. Average consumption dropped to 39.2mpg and CO2 emissions were an eye-watering 194g/km. Luggage capacity was unchanged but as part of the ‘V’ range, the 2.5 V6 TDI’s equipment list included traction control with electronic differential, front sports seats, 16-inch alloys and Alcantara upholstery. The B6 Passat was all-new and marked the end of the large-capacity diesels, with a 140hp 2.0-litre diesel in Sport trim being the nearest equivalent to our long-term VW. Performance suffered but efficiency improved over the previous V6 TDI: 128mph, 0-62mph in 10.1 seconds and a claimed average of 42.2mpg tell their own story. Emissions fell to 165g/km of CO2. What did Sport bring to the party? Rear privacy glass (not standard on ours! ), 17-inch alloy wheels, automatic lights and wipers and dual-zone climate control. There was a minor improvement in carrying capacity, too: 513 litres with all five seats in use, 1,641 litres with the backrest folded. 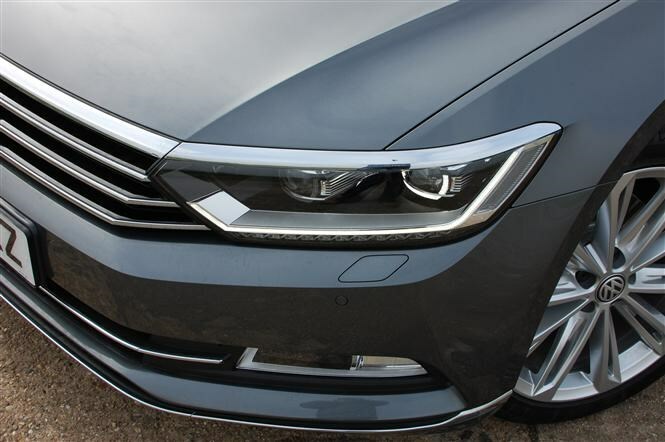 More of an evolutionary reskin than a simple facelift, the Passat B7 saw a variety of improvements, including the introduction of BlueMotion Technology for the 140hp 2.0-litre TDI engine. Sport trim now included sat-nav with a touchscreen for the multimedia system with niceties such as bi-xenon headlamps, LED tail lights and self-parking function now appearing on the options list. Volkswagen even managed to increase the carrying capacity to 603 litres seats-up and 1,731 seats-down. Standard features on the GT trim include keyless entry and starting, adaptive cruise control, parking sensors and reversing camera and three-zone climate control. Boot capacity’s a colossal 650 litres in five-seat mode, 1,780 litres with them folded over. 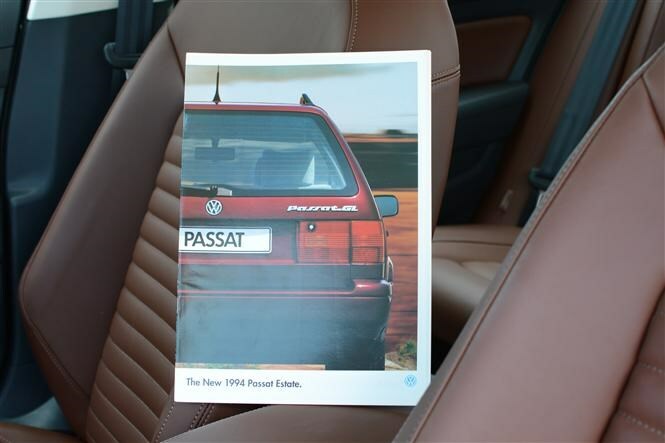 Thumbing through the aging brochures, what’s clear is that with each generation of Passat Estate, it’s always been a dependable, commodious and premium alternative to a host of rivals, not least multiple generations of Ford estates be they Cortina-, Sierra- or Mondeo-badged. That’s as true today as it was back in 1974. Spend no more than five minutes on any stretch of dual-carriageway or motorway during the melee of rush hour and you’ll spot a plethora of Passats plying the highways. There’s a reason for this – they’re superb cruisers. Comfortable, cocooned and quiet. But how good are they when you take them off the beaten track, wending your way around back roads? Producing 150PS, the 2-litre TDI motor under the Passat’s slinky bonnet isn’t the most powerful in the range: it also comes in 190PS and, with twin turbos, 240PS guises. Seeing as the VW weighs 1,503kg without anyone or anything in it, that somewhat curbs its speed. The engine’s strength lies in the 340Nm of torque available from 1,750rpm through to 3,000rpm. 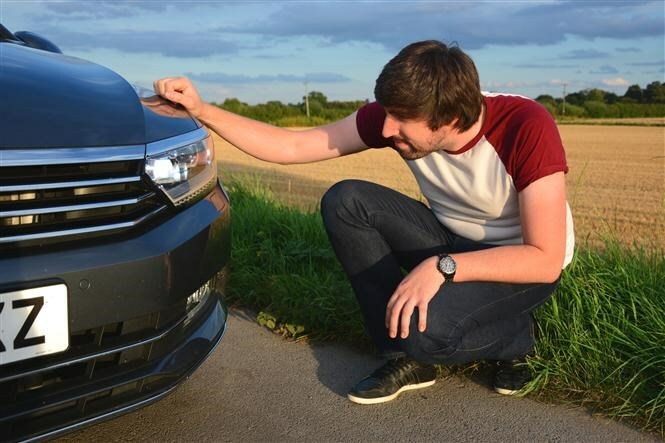 Yes, it requires some to-ing and fro-ing of the Passat’s six-speed manual gearbox – a DSG automatic would have suited it better – but there’s a pleasant and well-damped shift action to the stubby little lever. Keep an eye on the rev counter and you can surf that wave of torque easily, ensuring you’ve got the Volkswagen’s maximum potential accelerative grunt at your right foot’s disposal, much to the chagrin of the hot hatch hooner who thought he’d be past you miles ago. 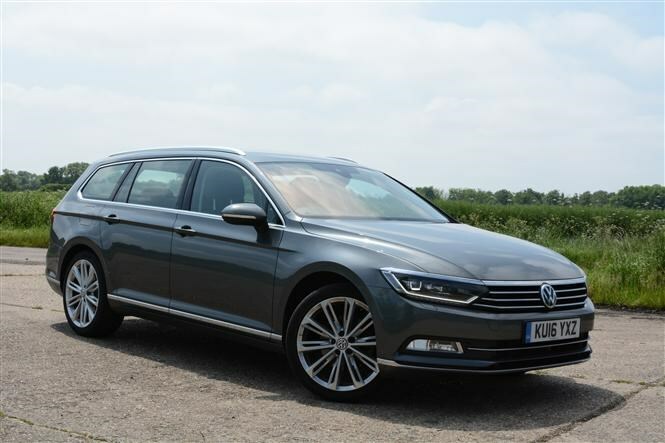 That’s all well and good when the road’s as straight as the proverbial poker but thanks to the optional XDS electronic differential the Passat’s a tidy bendsmith, despite its size. 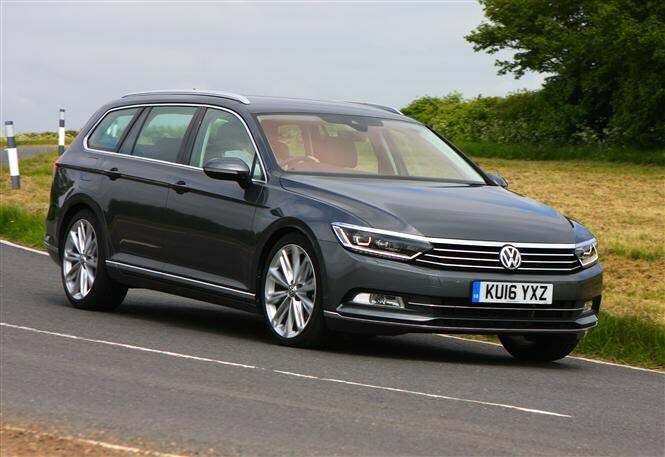 If you’re considering a Passat Estate – which you should do as it it’s the best large family wagon you can currently buy – then this £185 extra needs to be considered above all other options. It’s that good. 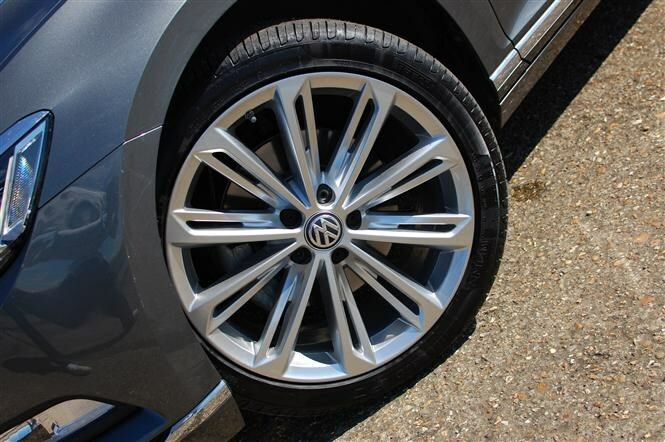 Punt a Passat without the XDS differential into a tight bend at speed and you’ll be on the brakes deep into the corner, scrubbing off pace in order to prevent the front tyres losing grip and washing wide of the line you intended – or understeering as it’s known in car circles. By metering out the power more effectively, sending the ‘outer’ wheel more grunt than the ‘inner’ one, this situation’s less likely to happen with XDS differential. Sure, any front-wheel drive car has a tendency to understeer if provoked enough, but the trick diff minimises the chances of it being induced, not only keeping you safer as you corner, but allowing you to make brisker progress into, through and back out of the bend. 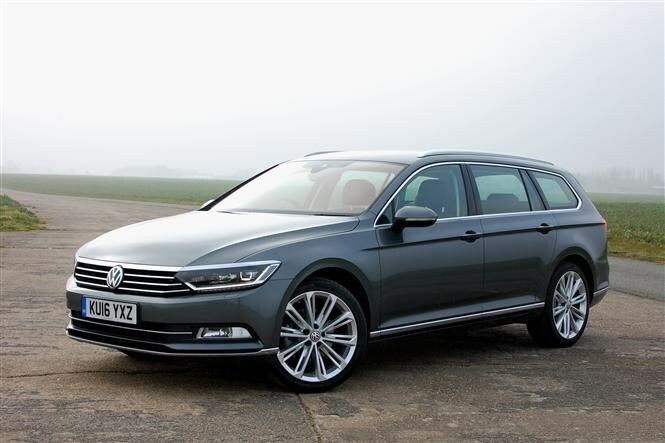 On smooth roads (yes, Britain has a few), the Passat Estate riding on upgraded 19-inch Verona alloy wheels and standard coil-spring suspension is good at maintaining passenger comfort but it lacks the nth degree of sophistication when the asphalt’s less than ideal. Much of my weekend driving revolves around exploring Lincolnshire B-roads, which aren’t famed for their unfettered surfaces. Here the VW is prone to riding harshly over ruts, transmitting that thud to the posteriors of those within. 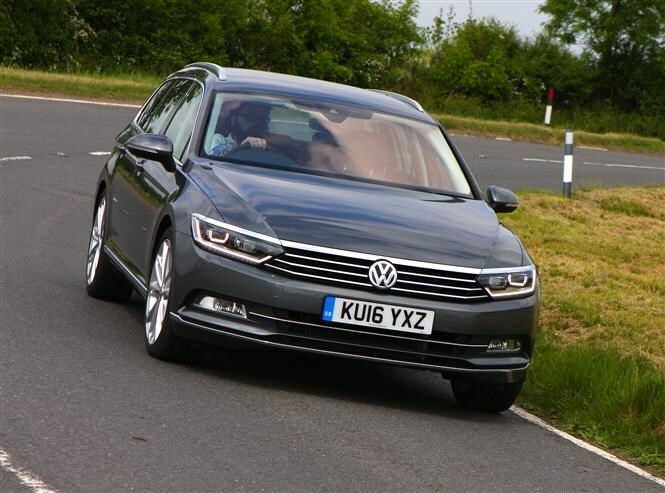 Even without DCC, the Volkswagen Passat Estate remains the best at combining comfort and roadholding in this class, finally wrestling the Mondeo’s mantle from Ford’s grasp. Inevitably, after three years in the industry, some of the glossiness loses its lustre, particularly when I’m trying to make my way back to northern Lincolnshire from Gatwick airport. At night. In the rain. Far be it from me to critique the lamentable judgment of whoever was responsible for closing off the M25’s junctions with both the M11 and A1 on a recent journey back from LGW, but suffice to say the M1 wasn’t the shortest of routes, and I finally made it back at 1.50am. Thankfully, the VW Passat Estate remained a paragon of comfortable motorway wafting. Overcome by that particular form of miserable, moody malaise, I decided I couldn’t be bothered to empty the boot of my laptop, manbag (complete with passport and wallet) and day-old Nikon DSLR camera, and only decided to remove my suitcase. It had my toothbrush in it, after all. 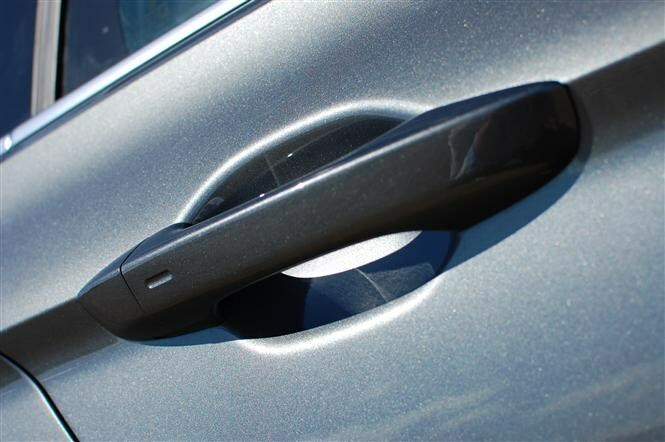 Tailgate closed, a tap of the driver’s door handle locked the car keylessly (the fob remained in my jeans pocket), and I entered the house and locked up. As the handy reconstruction video illustrates, when I bent over to pick up the house key I’d dropped (it was late! ), my thigh conspired to press the ‘open tailgate’ button on the VW’s key. Through the window I spotted the lights had come on but assumed the Passat had simply been unlocked so ‘relocked’ it which was confirmed by the amber flicker of the indicators. With that, I slept coma-like until morning until being awoken with a shriek at 7:30am because the tailgate was wide open. I rushed outside fearing the worst, but incredibly all the kit I’d left in the boot was still there. Subsequently, it’s happened a few times more, and always when I have the Passat’s key in a trouser pocket. Any movement that presses the key against my upper leg and the VW’s merrily flashing its lights as it unlocks or pops its tailgate. 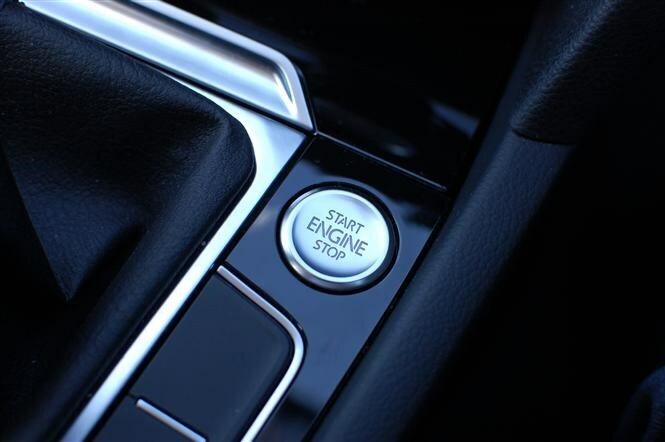 Whether our Volkswagen’s key is especially sensitive or I’m doing something to inadvertently confuse it is unclear – drop us a line on Facebook or Twitter if it’s happened to you. Some people are never satisfied. 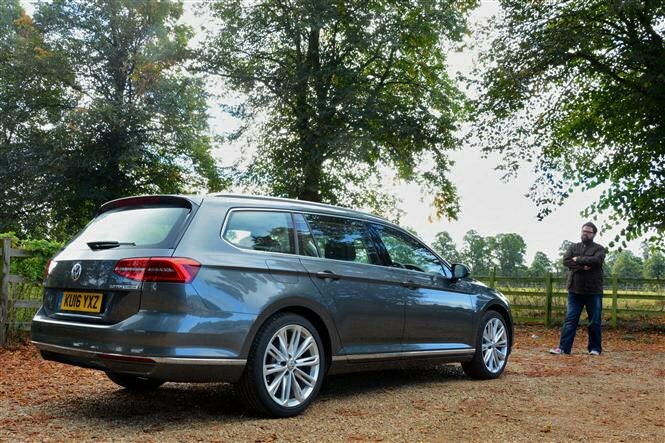 Despite the generously appointed kit roster that comes as part of the GT package, a former colleague, who had intended to run our long-term Volkswagen Passat Estate, added a further £6,805-worth of options to tailor the wagon to his liking. Note that’s to his liking – I would have plumped for a different range of delights from the extra-cost options ticklist, but I’ll save those musings for a future update. Anyway, I digress: having racked up over 1,600 miles in the 2-litre TDI-engined Passat, sufficient miles have been devoured to comment on the relative worth of those options. This I like. It’s a sensible, worthwhile upgrade of the standard multimedia package, stretching the colour touchscreen out to eight inches. 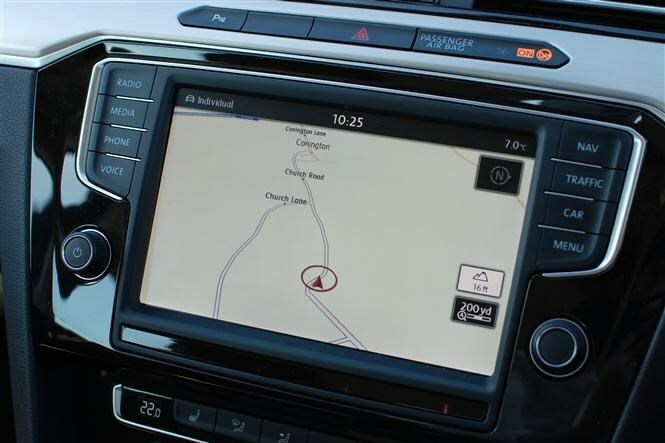 Its sat-nav function is one of the best available with classy graphics, unambiguous menus and the ability to play CDs and DVDs – a feature I’ve yet to sample but I’ve found the glovebox houses the hardware to play them. The package also boasts a pair of Car-Net features, only one of which I’ve so far tried. App-Connect apes the functionality of your smartphone on the infotainment screen, be it Android Auto, MirrorLink or, as in my case, Apple CarPlay flavoured. As with other installations I’ve tried, CarPlay certainly needs a bit more work in terms of converting your speech inputs into a coherent text message, but it reads them out clearly, while the music, mapping and telephony aspects work faultlessly. The unsnappily-titled ‘Guide and Inform Plus’ has not yet been subjected to a Jones-style examination, primarily because of Apple’s resolute stance on not letting the function tether to my phone. Grrr. I’ll rope in my eldest and his Android handset to try it out when he least expects it. Claimed to significantly boost your mobile’s signal, the Advanced Telephone Connection’s proved a bit hit-and-miss so far. Sections of my commute that experience call drop-off in other cars still suffer with it, albeit to a lesser degree. 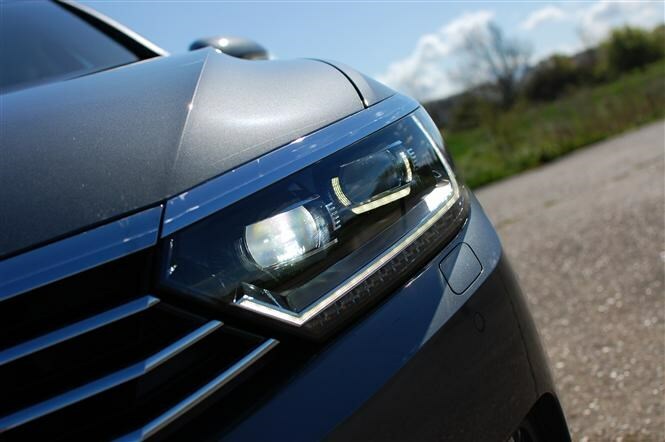 I’m a massive LED headlight convert and these units the Passat’s blessed with are superb, delivering bright white light that extends further - both forward and out laterally - than halogen or bi-xenon lamps. My only gripe is that the main beam function isn’t automatic; but that’s my laziness shining through. 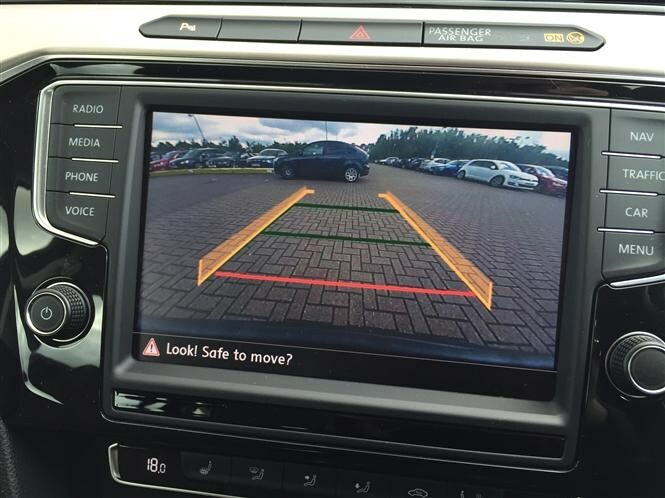 Rear cameras are a boon too – don’t believe this claptrap that they’re only for people who can’t park – they’re a sensible aid that help prevent scraped bumpers in snug multi-storey bays, allowing you to reverse back further than you’d dare with sensors or experience alone. 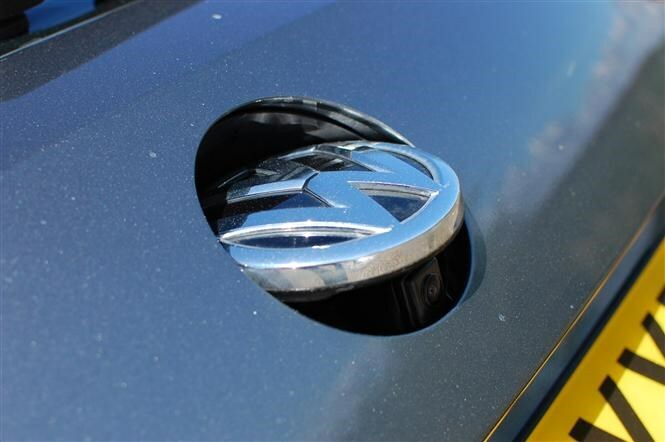 It’s neatly hidden behind the VW logo on the tailgate, ensuring it’s kept clean and useable when the rest of the car’s clarted in filth. That's quite a list and enough to push the asking price of our VW Passat Estate north of £35,000. If nothing else it proves that choosing options for a new car is an exercise that should be undertaken with caution. What might satisfy your heart when you’re ordering your car might leave your mind dismayed when you realise how little value it’s added come resale time. As a dyed-in-the-wool automotive enthuser it’s nigh-on impossible to answer, simply because the notion’s so dynamic. Not only do I not have a single favourite, what makes the top ten list one day doesn’t necessarily make it the next, especially if I happen to have seen something relatively mundane from yesteryear (1989 Nissan Laurel, I’m looking at you). Responding that my new long-term Volkswagen Passat Estate best fitted that description appeared to fox my interviewer. Initially, at least. 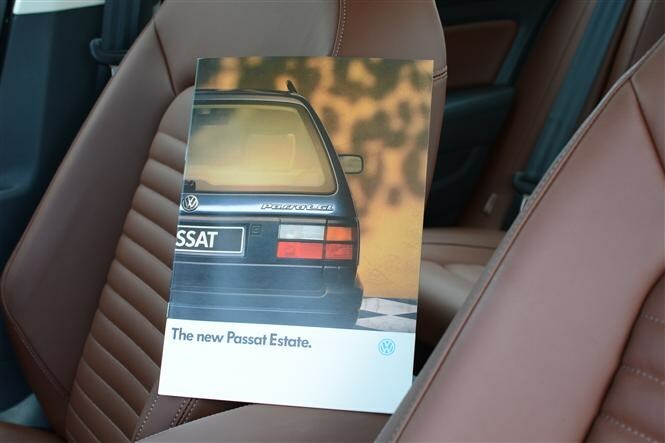 Don’t get me wrong, I fully expected to be impressed by the latest Passat. After all, it’s the large family car we rate as the ultimate vehicle in this segment, rendering the Ford Mondeo, Mazda 6 and Vauxhall Insignia to the ranks of also-rans. What’s taken me by surprise is how impressed I am with it. There’s a sheer quality about the whole car that’s resolutely deep. 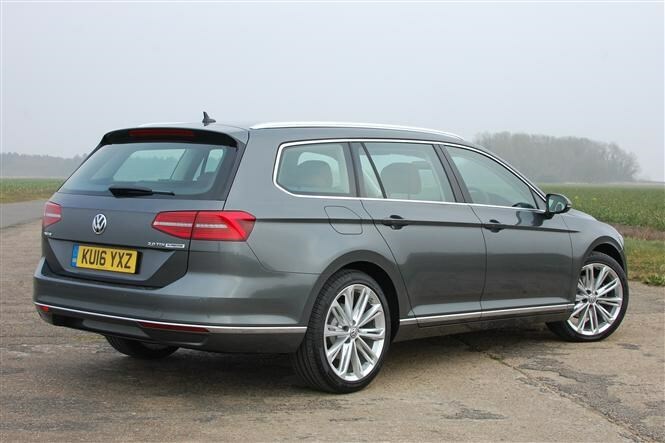 We’ve gone for the most popular engine and gearbox combination for VW’s large estate – the 148bhp (or 150PS if you prefer) 2-litre TDI diesel – and paired it with GT trim. Think of that more as a synonym for luxury than sportiness. After my quizzer had prodded and poked about the interior, appreciating the degree of dashboard squidge and the tactile satisfaction of twisting knobs and pushing buttons repeatedly, I turned the tables: how much do you think it costs? Several umms and aahs later, a figure of £50,000 was ventured, qualified by comparisons with time recently spent in a variety of contemporary BMWs, Jaguars and Mercedes – it feels more expensive than all of those. 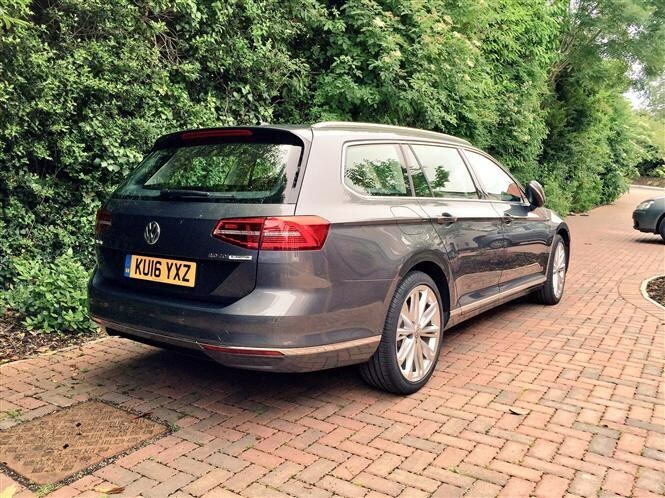 So, how much does this capacious new wagon actually set you back? £28,425. Hardly a luxury car price tag and considerably under the £40,000 threshold that’s being introduced for April 2017’s revised VED car tax system. Of course, that’s only part of the story as this Passat’s been armed to its teeth with an array of goodies from the extra-cost options list. I’ll explore the merits of each in future updates as they prove their worth, or otherwise, of their collective £6,805 price tag, but a few are visually obvious. 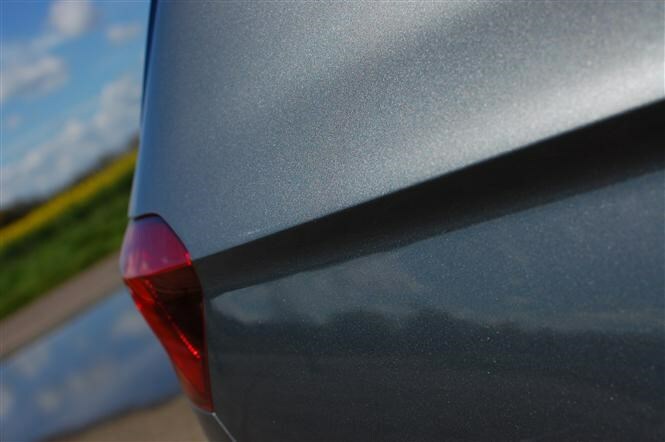 There’s metallic Indium Grey paint, a classy, understated choice at £545 that complements the brightwork liberally applied to the Passat’s exterior. The upper edge of the grille and headlamps is embellished further with a chrome strip advertising the full LED headlamp option (part of the £1,340 Vision and Communications Pack), while the wheels have been upgraded to 19-inch Veronas. They don’t ruin the ride quality but I can’t help but think some – maybe all – of the firmness encountered could have been negated by opting for Dynamic Chassis Control with its adaptive suspension. 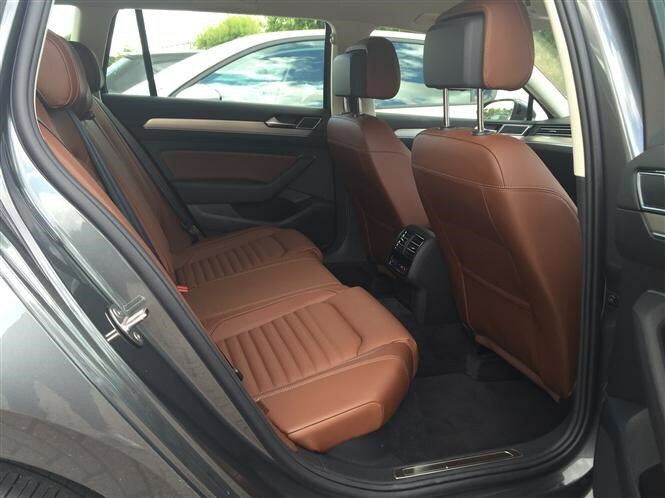 Inside is the biggest talking point: out’s gone the standard grey leather and Alcantara faux-suede, the seats and door panels instead trimmed in soft Marrakesh (that’s brown to you and I) leather. It’s growing on me, in part because it doesn’t look like the chairs have been smothered in Cadbury’s Bournville as the online configurator suggested. Picture something midway between Caramac and Galaxy bars and you’re about there. Anyway, that’s £845, but includes heating for the seats in both the front and rear. Lots to explore then – both in terms of equipment and the cavernous space on offer – but so far it seems I’ve bagged a bargain luxury car.